Instagram has shown to be very effective in driving sales. In fact, Engaged Instagram users have an order value of $65. And as if that wasn’t enough, a survey from 2015 found that 75 percent of Instagram users have taken action into buying something after being inspired by a post. In other words, if you aren’t using Instagram for marketing and to drive more sales, you’re missing out on a tremendous opportunity. As a marketer, you want to take advantage of all tools and features possible that can help make your life easier or help you generate better results. Instagram shoppable posts, also (unsurprisingly) called “shopping on Instagram” is such feature. Chances are, you’re already using Instagram but are exploring new ways to generate better results and drive more traffic, right? For marketers, Instagram shoppable post is a dealbreaker. It opens up a completely new way for marketers to use Instagram to promote and sell their products. We all know how limited the opportunities in directing your customers on Instagram through your posts to your website is. The only way is to promote your products in a post and then ask people to click on the link in your bio. Kind of inefficient, especially considering the fact that you want to make your customers’ purchase journey as simple and quick as possible. Fortunately, all of that has changed with Instagram shoppable posts, allowing users to see a post of a product from a brand, tap the product, and get directed directly to the page where you order it. In this post, we’re looking at Instagram shoppable posts, how you can use it to your advantage, and learn everything you need to know about it. Shopping on Instagram was first introduced in late 2016, however, it was strictly limited to 20 selected u.s.-based retail â€trial” brands such as Kate Spade, JackThreads, and Warby Parker. If you’re familiar with Instagram, they never make big new updates for everyone at the same time in order be able to quickly identify and solve bugs as well as improve the feature with opinions from the test accounts. And this is exactly what Instagram wanted to help users do with shoppable posts. Shoppable posts allow brands to add tags to their posts that lead their followers to that particular product page on their website were Instagram users can effortlessly and seamlessly shop the product that Inspired them in the post they just saw. As I mentioned earlier, shopping on Instagram was far from seamless back in the days. You scrolled through posts, and if you found a product you liked, you had to go to the profile of that brand, hope that they had a link to their website in their bio, and then actively look up the product to purchase it. That’s far from a seamless shopping experience if you ask me. Posts with shoppable tags are clearly visible in the bottom left corner of a post that makes discovery simple. When you scroll through your feed you’ll see “Tap to View Products”, and the post is designated with a little shopping bag icon. When you scroll through a brands’ feed that has access to shoppable posts, you’ll see a small shopping bag in the top-right corner of the post. If you see a product you like on a post that has shoppable tags, you can tap the image to see product details. This will make pop-ups appear (one pop-up per product tag) where you’ll get access to price and the name of the product. In turn, you can click on the pop-up that belongs to the product you are interested in. This will open up a new page inside the Instagram app where you can get full access to information about the product. If you tap the “Shop now” button, that will be clearly visible, you will be taken to the company’s website where you can add the product to your shopping cart and purchase it. Remember that the completion of the order is made on the brand’s own website and takes place outside of Instagram. Does the feature cost anything? Instead of taking a cut of the purchase amount, which is a common method for other services to make their income, Instagram is planning on taking a different approach. Instead, they’re planning on monetizing the feature by letting business accounts pay to display their shoppable photos in the feeds of users who don’t follow them already. In other words, through shoppable posts in the form of ads. While everything isn’t clear as ice, you can expect the feature to be completely free if you’re using it on your organic posts, but Instagram will instead offer you to create ads in the form of posts where the shoppable tags are visible. For Instagram, the new update has two main benefits. First off, Instagram is hoping that shoppable tags can provide extra incentive for businesses to invest more money into sponsored posts on the platform, but also that users are staying on the platform for a longer time, because people never have to leave the platform to make a purchase or get more product information since all of that is already integrated into the app. The main reason to this feature is that Instagram realized how many brands and marketers used their platform for marketing purposes, and they realized that they needed to do a lot to improve their experience with the platform and how they could help marketers generate better results. In other words, they realized that brands were a relatively large share of their users, and they needed to pay more attention to them when developing the app to retain them and attract new ones. In fact, there are 15 million registered businesses using Instagram business profiles. Another reason that Instagram started looking at ways they could improve brands’ experience with the app was that brands are the ones that finance the platform by paying for ads. Instagram is solely funded by ads, and to increase their revenue, they needed to make lots of changes in the way the app worked – both for ads and for the overall usability. Today, Instagram has more than 1 million monthly advertisers. This is an increase of 800,000 from the same time the previous year. A huge deal was when Instagram introduced Instagram Insights, a built-in analytics tool that allowed marketers to see the statistics of their efforts on the platform which sent signals that Instagram is acknowledging the fact that brands are using it for marketing. Instagram shoppable posts are still only available to a select number of users. 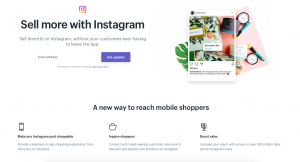 Now, the e-commerce company Shopify has teamed up with Instagram to allow retailers to use shoppable tags. In the beginning, shoppable posts were only visible to users in the US, but now, people from all over the world can see them. Who can use them, that’s a completely different story. With the feature, retailers can only sell physical products, and you can only use a maximum of five tags for each post. When you use shoppable tags, you can not tag accounts in your posts like you normally can. What’s more, businesses that have access to shoppable posts also gain access to insights around metrics connected to the tags such as how many people have tapped your tags, and how many people tapped the “shop now” button. The insights are yet another way for Instagram to help brands get more information about how their posts are performing and how they can improve their social commerce techniques. Since it isn’t possible to add links to your posts on Instagram, a choice by Instagram in order to prevent spam, shoppable posts are the quickest and most seamless way for brands to get their audience to their store. Before this update, brands often users third-party tools and applications to make their feeds shoppable – but this took place outside of Instagram. In case you didn’t know, Instagram is extremely sensitive to people using third-party apps to complement Instagram because they take their users outside of the apps. And Instagram, as you would expect, wants to keep their users on the platform as much as they can. Before, people used third-party apps to save posts they saw on the platform. Instagram acknowledged this and introduced the collection feature, allowing users to do just that, but in-app. Before, Instagram noticed that people were using third-party apps to download photos and videos on Direct Message so they introduced a feature that allows people to do just that – in-app. Before, brands used third-party analytics tools to get insight into how they performed on the platform. Instagram acknowledged this and introduced Insights. A feature that allows users to do just that – but in-app. Instagram noticed that people were using third-party tools like Curalate’s Like2Buy to link their Instagram posts and online stores and make their followers’ shopping experience better. But with shoppable posts, there’s no need for that. The feature has been met with positive reactions both by brands but also by users. The idea behind this feature is fairly simple. If you share a post where your product is visible, tag it with the product and then share it. This means that there isn’t much room for creativity when using it, however, those brands that have used it report tremendous success from it. How do I get access to the feature and make my posts shoppable? Right now, the feature is only available to a few selected brands. More correctly 30,0000. A relatively small amount considering that there are over 700 million active users on the platform, including over businesses, businesses which most of them would benefit from getting this feature. At the moment, the only way to get access to shoppable posts is by applying, but considering that applications are closed, you’ll have to wait and see if and when Instagram releases the feature for all businesses – something they are expected to do in the future. I’ll constantly update this article and let you know about the latest news on this matter. If you have got accepted into the beta program, you need to complete a few steps before being able to use it. The shoppable post feature is currently available only to Instagram accounts set up from an IP address based in the U.S. or that was downloaded in the U.S. Of course, this restriction could change for upcoming rollouts of the feature. Youâ€™ll also want to verify that your Instagram account is updated and running on the latest version of the app to ensure proper integration with the feature. You need to have a Shopify account. They only offer paid plans, but you can choose one that’s best for your budget. All of the plan options from Basic and above qualify for the Instagram shoppable post feature. You can choose a plan option here. Whether the future program will require a Shopify account or be managed directly within Instagram is still unknown. To integrate the shopping feature on Instagram, you must have a product catalog set up on your Facebook page. You can integrate your catalog by connecting your Facebook page to your Shopify account. If you already have a product catalog, check the features in your Shopify account to ensure your products are linked properly. To sell on Instagram, you need to have the actual products in your Facebook catalog. These must be physical products; they can’t be services or digital products. Determine which products you plan to offer for purchase and follow the steps through your Shopify account to upload those products to your Facebook catalog. You need to set up each product individually and have the details of the product, including the name, price, and link to the product on your website. You’ll also have to choose from a variety of applicable categories that qualify for the shopping feature. These categories include apparel/accessories, health and beauty products, packaged food/beverages, electronics, toys, art, books, flowers, and more. For more details on the requirements for setting up your products for integration, see this Shopify support page. To tag new products in your posts on Instagram, ensure you update your Shopify account and Facebook catalog with those new products. If you’ve already applied to the beta program, you’ll have to wait to see if you’re accepted by Instagram. If you are, you’ll receive a notification on your Instagram account. If you haven’t yet applied and want to try to, it’s worth a shot! If you don’t get accepted into the beta program but you know you want to use this feature in the future, it may be worth it to complete as many of the steps above as possible to ensure you’ll be ready to go when it gets rolled out publicly. If and when you get access to shoppable posts on Instagram and you’ve completed all the setup steps listed in this article, the process to add tags to your Instagram posts is relatively easy. You’ll begin the upload process to add an image to Instagram just as you would any other image. Edit and add filters just as you would if the image were being uploaded by itself. It is the steps after you’ve selected an image that differs a bit if you have the shoppable post feature on Instagram. When sharing your post, you’ll find the option to tag your products in the part where you write your caption. Note that you cannot tag users in the image at the same time as you’re tagging products as this could get really messy. When you’ve selected the tags to use, tap next and share the post! The Instagram shoppable posts tags is a huge addition to Instagram and their work of making it more business-friendly. The new feature opens up completely new opportunities, and it can also encourage more brands to hop on the large photo-sharing platform. PrevWhat is Social Selling And How Can You Use it to Nurture Customer Relationships?